The Anchorage School District and the union that represents thousands of the city's educators will return to contract negotiations Tuesday. 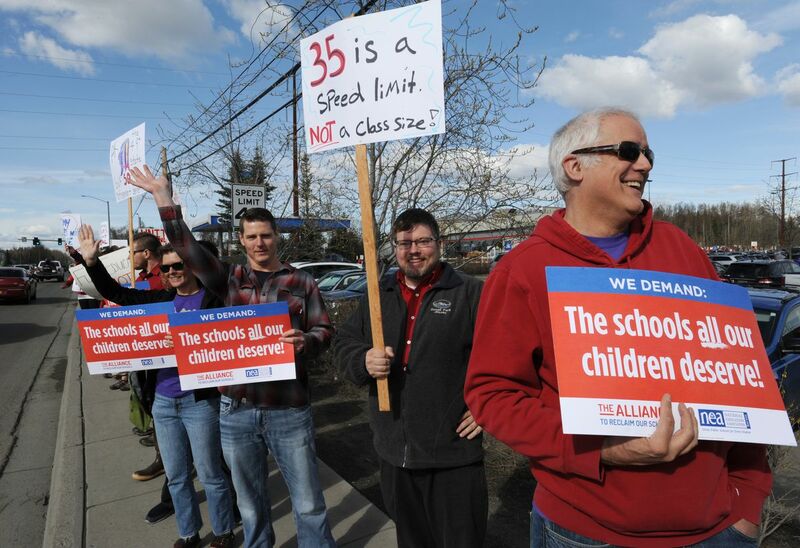 The district and the Anchorage Education Association teachers union have tried to reach a contract agreement since April, eventually hitting a stalemate and calling in two federal mediators from Seattle to help. But even with the mediators, the groups didn't reach a compromise in October. They'll try again this week. Officials with the school district, union and Anchorage School Board have said they're hopeful that mediation will yield a tentative, three-year contract agreement. Meantime, frustrations are mounting among educators. The union's contract expired June 30. Its roughly 3,300 members — including classroom teachers, counselors and school nurses — continue to work under the expired contract's terms. In recent months, Anchorage teachers have gathered outside schools and the administration building with signs such as: "No contract still working." They've held a "walk-in" on the first day of school. They've packed school board meetings, airing concerns to board members. "I don't think I need to tell you that there's a significant morale crisis among ASD educators," high school teacher Brian Mason recently told the board at its last meeting, on Oct 22. Mason was one of about 35 teachers who testified at the meeting. Some teachers spoke about the loss of the middle school model. Some said they felt frustrated by the limitations imposed by a "canned curriculum" in elementary schools. Some talked about working without a current contract. Some said they don't feel respected as professionals. Many directed their ire at a comment a district administrator made at a meeting that was recorded. Speaking about contract negotiations, the district's chief human resource officer, Todd Hess, had said: "Just in case anyone wondered, we have a manufactured crisis." "Members of the board, our current morale crisis is not a manufactured crisis. It is very real," said Mason, who's also the parent of two elementary school children in the district. Hess said in an interview he was "referring to union activities," not teachers. "Our teachers work hard," he said. At the October board meeting, Anchorage Schools Superintendent Deena Bishop said she welcomed the settlement of a contract with the teachers union, but it's not easy when the funding isn't there. Everyone wants students to do well, she said. The district has goals and has made some changes, she said, and it's discomforting to go through change. "I don't want to, for any reason, say that things are easy and they can just get done," she said. "There is discomfort, but I believe we orient ourselves to the future and kids will do well." The bargaining teams for the union and district have a list of items to settle before they reach a contract agreement. That includes major parts of the contract such as salary and health benefits. It also includes more intricate changes to contract language. Members of the teachers union are paid based on a combination of experience and how much college education they have. The salary schedule in the expired contract starts at $48,886 for a teacher with no experience and a bachelor's degree. It tops out at $89,982 for those with doctoral degrees, maximum college credits and 20 years' experience. Some teachers can still see their base salary increased — referred to as "in lieu of" steps — once they've reached the highest number of years' experience in the salary schedule. The union's proposed three-year contract includes three raises over three years to the base pay in the salary schedule: 3 percent in the current school year, 3 percent in the 2019-20 school year and 3.5 percent in 2020-21. The school district has proposed no increase in the current school year, a 0.75 percent increase in 2019-20 and a 1.5 percent increase in 2020-21. Under the union's proposal, a teacher with no experience and a bachelor's degree would earn about $53,678 in 2020-21. Under the district's proposal, the teacher would earn about $49,990 that year. The district and the union also continue to remain far apart on health benefits. Under the expired contract, the district pays $1,645 per person per month. The district has proposed paying the same amount in the current school year and the next school year, then increasing the monthly payment by $50, to $1,695, in 2020-21. The union's proposed contract increases the district's monthly payment by $390 over three years, growing to $1,745 this year, $1,884 next year and $2,035 in 2020-21. According to the district estimates, the union's contract proposal would cost an additional $54.4 million over its three years. The district's proposal would cost about an additional $12 million over its three years, said Jim Anderson, the district's chief financial officer. Under the expired contract, the district spent about $345 million on salaries and benefits for members of the teachers union, Anderson said. The district's total general fund budget for the current school year is about $565 million. — A new committee: The union's contract proposal includes the creation of a new committee tasked with making program and curriculum recommendations to the board. The committee would be made up of union members and district representatives. Committee members would meet during the contract day or be provided with additional pay. The district's contract proposal doesn't include the creation of a new committee. — Indoor and outdoor play: The union's contract proposal says that in addition to at least 20 minutes of scheduled recess for elementary school students, the district will allow union members the flexibility to provide their students with more time for indoor and outdoor play. The district's contract doesn't include this added language. — Pay for additional classes taught: The union wants high school and middle school teachers to be paid for "each additional instructional period taught beyond five periods," according to its proposal. A majority of middle school classroom teachers currently teach six out of the day's seven periods, instead of five, according to Tom Klaameyer, president of the teachers union. This isn't included in the district proposal. — Lesson plans and furniture: The union wants to add language to the contract that says only union members on a growth or improvement plan will be required to submit lesson plans. Also, the proposal says, union members will "be given the professional freedom to arrange classroom furniture, materials and supplies to best meet the needs of planned learning activities." Neither of these additions are included in the district's proposal. The two days of mediation will begin on Tuesday — Election Day. As the groups try to work out a contract, Alaska voters will be deciding on candidates, including the next governor, who will influence how the state spends on education. That state funding will, in part, fund the contract under negotiation. The mediators tasked with helping with negotiations come from the Federal Mediation and Conciliation Service, paid for by the federal government. Instead of the bargaining teams for the school district and union talking directly, the mediators go back and forth between the two sides and try to find a compromise. If the groups don't reach an agreement this week, they can either go back to bargaining or go to advisory arbitration, as prescribed by the collective bargaining process outlined in state law. During arbitration, both sides present their best offer, and a third-party arbitrator decides what the contract should look like. The district and union can decide to accept it or reject it. If arbitration fails, the union could decide to strike. Klaameyer said the union is "hoping to avoid that." "The best strike is the one you never have," he said. "We're hoping mediation yields an agreement. That's just better for the district, it's better for employees, it's better for communities." 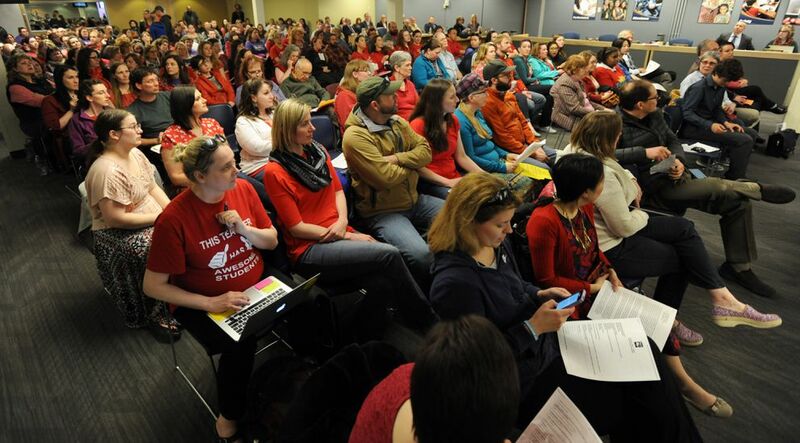 There's a history of strained negotiations between Anchorage teachers and the school district. The last time Anchorage teachers went on strike was in 1994, according to a Daily News story. The Daily News reported that 2010 was the first time in the previous decade that the two groups reached a tentative contract without going to arbitration. Teachers threatened to strike in 2007, but in the 11th hour made an agreement with administration. More recently, the two groups spent more than two years negotiating the last contract, finally agreeing to a one-year deal in February for the 2017-18 school year. The contract took effect retroactively and expired less than five months later. Before that, the groups had agreed to a one-year contract extension for the 2016-17 school year. School Board President Starr Marsett said in an interview that she remained optimistic that the union and school district would reach a tentative agreement this week. The union would then have to vote on the agreement and the board would have to ratify it. "We want as much as anyone else to settle this contract," Marsett said. "Teachers — we want them to be happy. We want to move forward. We definitely want a three-year contract." Union members are concerned, Klaameyer said. Some are also hopeful and some are growing impatient. "Everyone just wants to focus on their job of educating students," he said. "There's an instability here that's unnerving for everyone."